LiquorWise: Red Wine Please - Not Red Tape! Red Wine Please - Not Red Tape! Liquor Licensing – Most business owners in the hospitality industry would march on parliament tomorrow if they believed it would reduce the red tape with which they have to deal with on a daily basis. The liquor licence application process in particular has been burdened with a myriad of new documents and prescribed procedures since the implementation of new liquor acts in 7 of our 9 provinces (Limpopo & North West still uses the old, 1989 Act). The bad news - it isn’t likely to improve soon – legislation takes at least 2-3 years from start to finish. Add to this the fact that politicians are trying to use legislation to curb alcohol abuse and one can expect red tape to increase rather than to diminish. The good news - The Licence Co is continuously developing ways to make it easier for licence holders to apply and manage their licences. Their new, online application will be launched soon. This promises to reduce the cost to the consumer and save time by assisting the applicant (client) to manage and track each application. 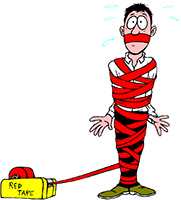 If we cannot reduce the red tape, we will at least try to make it as easy as possible for licence holders to manage it!